An Italian meal is made better with a large, glorious pizza at the center of the table. To make your lunch or dinner even more special, you can order wood-fired pizza in Middleton, which many people believe is superior to pizza cooked in a conventional oven. Wood-fired pizza in Middleton is a popular dish because of its unique flavors, distinct texture, and classy presentation. Just what is it about wood-fired pizza in Middleton that makes it so irresistible? To cook wood-fired pizza in Middleton, Benvenuto’s Italian Grill gets a fire going inside an oven. A wood-fired oven gets extremely hot, surpassing temperatures inside regular kitchen ovens. This high heat makes wood-fired pizza in Middleton taste significantly better. Wood-fired pizza in Middleton cooks evenly. The heat that radiates from the source, which is firewood, spreads evenly inside the oven’s interiors. This kind of environment makes sure that every inch of the pizza gets the same amount of heat. With wood-fired pizza in Middleton, every bite will taste just as good as the next one. Wood-fired pizza in Middleton has a signature taste. Our method of cooking enhances the flavors of wood-fired pizza in Middleton. You will notice that wood-fired pizza in Middleton has a smoky taste that cannot be replicated by gas or electric ovens. This is why those who seek authentic Italian flavors prefer wood-fired pizza in Middleton. Wood-fired pizza in Middleton is crispy yet soft at the same time. We’ve all experienced eating soggy pizza even if it just came out of the oven. This happens when the oven is not hot enough to produce the ideal crust texture. 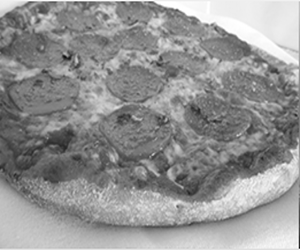 With wood-fired pizza in Middleton, you won’t get this result. Wood-fired pizza in Middleton is noticeably crispier, especially if you order the thin-crust variant. While the crust is cooked to crunchy perfection, the insides and toppings remain soft and chewy. This contrast is what makes wood-fired pizza in Middleton a favorite among Italian food lovers. They say that eating starts with the eyes. You can easily notice the difference between fast-food pizza and wood-fired pizza in Middleton in terms of their presentation. Wood-fired pizza in Middleton looks classier and more enticing thanks to its charred effect. The toppings are assembled more intricately and the cheese oozes out, tingling your taste buds. Because it is cooked in high temperatures, wood-fired pizza in Middleton is ready after a few minutes in the oven. The vitamins and nutrients in the vegetables are retained, and freshness is preserved. You will not be getting soggy bell peppers or onions with this cooking method. What’s more, the high heat burns off most of the oil in the pizza, which is especially appealing to people trying to reduce their fat intake. You can always drizzle more olive oil on your pizza if you want more moisture and flavor. At Benvenuto’s Italian Grill, we have a commitment to excellence in all aspects of dining, from the food and service to the restaurant ambiance. Our menu has something for everyone, and convenient dining options are available to busy people. We have a selection of wood-fired pizza in Middleton that includes Formaggio, Three Meat, Benvenuto, and Margherita. Our restaurant uses only high-quality ingredients and sauces seasoned to perfection for our wood-fired pizza in Middleton. You can even choose between hand-tossed or thin-crust pizza. Feel free to upgrade to a cauliflower crust as well. If all of these sound good to you, visit us today and taste the difference of our wood-fired pizza in Middleton! Have an unforgettable dining experience at Benvenuto’s Italian Grill. One taste of our delightful Italian dishes will surely leave you wanting more. Click here to learn about our rewards program. Bring your friends and family over to one of our locations today!